The Place Where the Mountains Meet the Ocean. Awaken your senses on the shore and stroll along the beaches. Go for a swim, hike through the mountains and take time to go fishing. 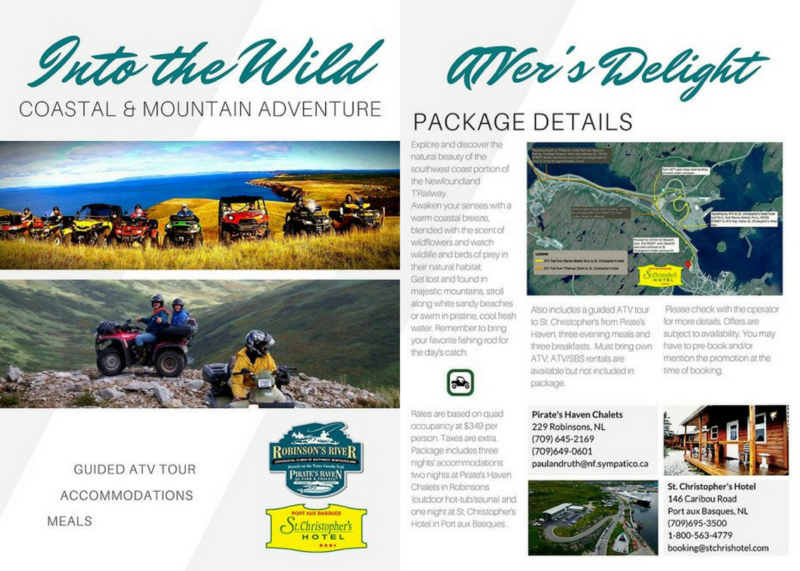 Explore and discover the natural beauty of Newfoundland’s southwest coast on a guided ATV tour from Pirate’s Haven to St. Christopher’s Hotel. Package includes 3 overnight stays, 3 dinners and 3 breakfasts. Must bring or rent ATV. This is a 4 day Coastal and Mountain Adventure package with 3 overnight stays offered by Pirate’s Haven Chalets and St. Christopher’s Hotel. Starting at $349 per person. We are a 3 ½-star rated, Canada Select Hotel, that is nestled on a hillside with a panoramic view of the harbour at the provincial “gateway” Port aux Basques, Newfoundland.